Happy 4th of July! 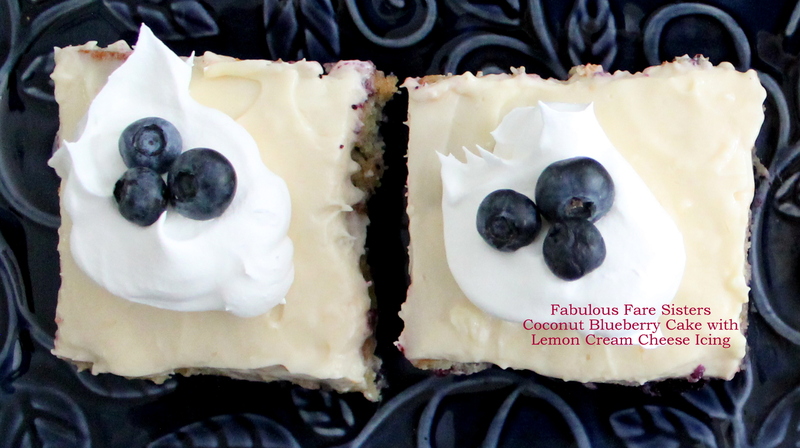 In honor of the national holiday celebrating our independence, here’s a luscious and dense Coconut & Blueberry cake, frosted with a creamy Lemon Cream Cheese Icing and topped off with fresh blueberries. The perfect dessert to add to your holiday menu. Pop on a few fresh strawberries and you’ve got the red, white & blue theme covered…Enjoy your holiday! Heat oven to 350 F. Combine the flour, baking powder and salt in a mixing bowl. In a second mixing bowl, combine the sugar, eggs and vanilla. Using an electric mixer, beat on medium speed for a few minutes. Add half of the flour mixture, then the cream of coconut, and finally the remaining flour. Beat another minute. Pour into a greased 13″ x 9″ greased baking dish and bake 30 minutes. Remove and allow to cool. 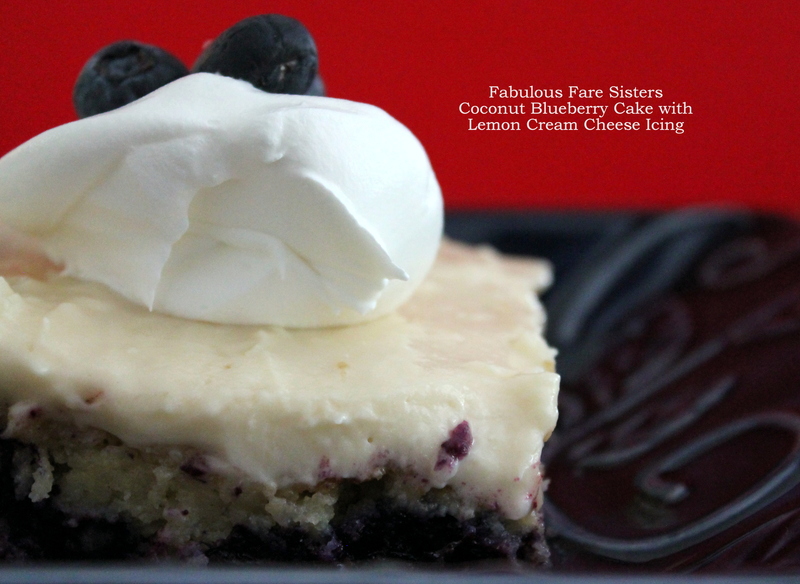 Make the Lemon Cream Cheese Icing. Combine the ingredients in a mixing bowl and beat with an electric mixer until smooth. Frost cooled cake. 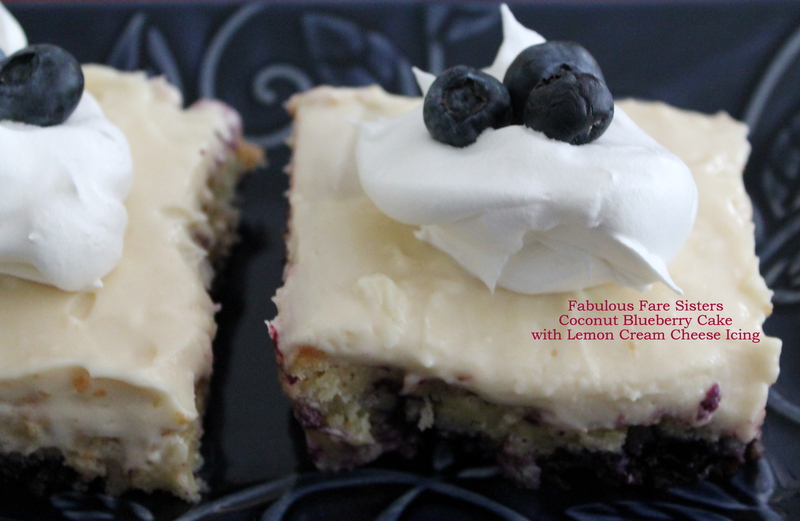 Slice cake and serve with whipped cream and fresh blueberries. Refrigerate leftovers. This recipe has been shared on Throwback Thursday, Fiesta Friday, Funtastic Friday, Foodie FriDIY, The Pin Junkie & Saucy Saturday….go check it out and then go visit other great sites! I love all these extra special twists in this recipe! Thanks for sharing with us at Throwback Thursday! Now this what I call ‘Fabulous fare’ 🙂 Lovely! Hope you had a lovely 4th July Linda! Ohh this looks so delicious I just drooled a bit!